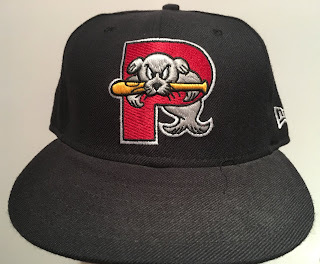 2005-2007 Portland Seadogs - Fresh Fitted Friday!!!! 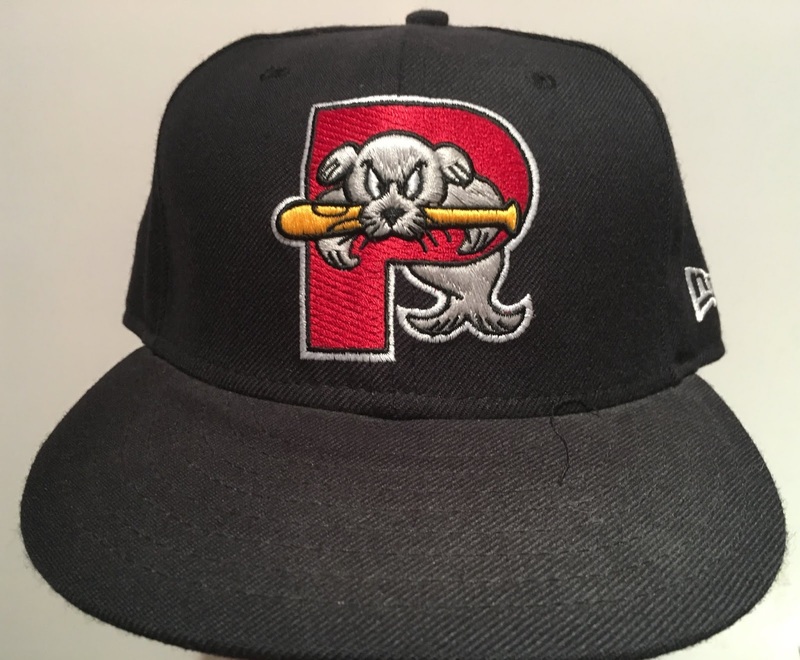 I made it to my first and only game in the month of June last Saturday and while I considered posting the new hats I picked up at the stadium that night, this week's Portland Sea Dogs hat is even more special as I am choosing to feature it in honor of my friends getting married in Maine this weekend. You have to respect this logo's longevity as the design has been with the club since the inaugural season in 1994. There's no chatter of it going away although there are a few weekend specific caps being worn this year. As we've seen on other hats, the blue box sweatband tags came about sometime in 2005 as did the "Originators of the True Fitted" text on the satin taping, both of which are featured here. 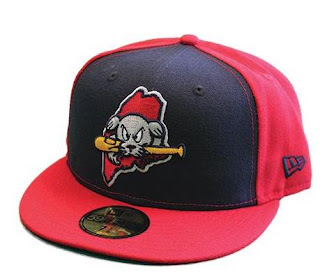 I don't usually have much to say about the MILB batterman but one thing of note on this cap is that it's a thicker patch similar to the 2006 West Tennessee Diamond Jaxx hat I wrote about in June 2017. As I mentioned earlier, there are special-edition hats being worn this year and this is the Saturday game hat. I would have preferred a white panel with blue rear panels and a red brim but nobody remembered to ask me! This is the Sunday hat. 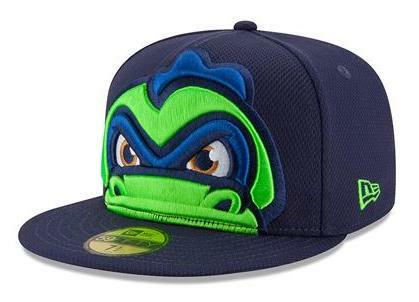 I like it a lot as the size of Slugger The Sea Dog here reminds me of the Vermont Lake Monsters BP hat pictured below. Champ is looking extra ninja turtley here! 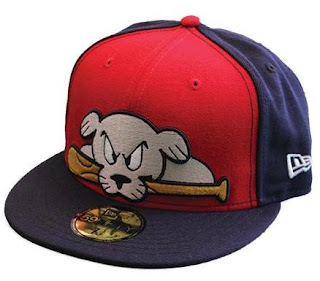 I'm hoping to get to a Sea Dogs game at Hadlock Field on Sunday but even if I do go, this hat is unfortunately way too small for me to wear. In addition, its design plainly features a Red Sox colorway which is off-limits for a New Yorker. Even though I'm a San Francisco Giants fan, I have to be true to the town I live in. If I do make it to the game, I'll wear the Florida Marlins version of the Sea Dogs hat I wrote about the last time I went to Maine, which coincidentally was also on 4th of July weekend but back in 2015. Lots has changed since then, but hopefully you still enjoy reading these posts! Because this cap is too small for me, it's going to have to go on the Trading Block so please don't hesitate to reach out if you want this or any other cap from that list and you are willing to part with any of the hats on my Wish List. 1996 Great Falls Dodgers - Fresh Fitted Friday!!! Syracuse Chiefs - Fresh Fitted Friday!! !